To millions of readers the world over Isaac Asimov is familiar as a prolific and erudite writer in the fields of science, science fiction, history, philology, bible studies, and most recently Shakespeare. What many may not know, unless they have been fortunate enough to hear him lecture, is that he is also an irresistible raconteur who could (in fact does) pursue what amounts to a second career as a great standup comic. Here is a lifetime harvest of his favorite anecdotes, jokes, puns, and scandalous verse—640 selections in all. Everything is included, from the original shaggy-dog story (in mercifully truncated form) to famous put-downs from ancient history, from the cerebral whimsies of Talmudic wit to the bawdiness of the barracks. There is bout to be something new to every reader, for Isaac Asimov’s taste ranges far and wide; moreover, many of the jokes are original and presented here for the first time. But this book is more than a glorious fund of humor made easily accessible to the most casual reader, for the author has interwoven the jokes with a very personal running commentary providing much informed advice on how to tell them effectively. He offers further anecdotes from his own experiences, both on the lecture platform and parties great and small, as well as gleanings from his philosophy of what humor (and life) is all about. So if you are a professional speaker (or perhaps even more important, an amateur speaker), use this book as a source of great stories with which to beguile your audiences. If you are a casual or curious browser, use it as an infinite source of pleasure and satisfaction. Either way you will find yourself in intimate contact with a man of boundless enthusiasm and good will, whose stories can’t fail to tickle your fancy and whose joy in life is blessedly contagious. This is a delightful and very funny book which I’d strongly recommend. 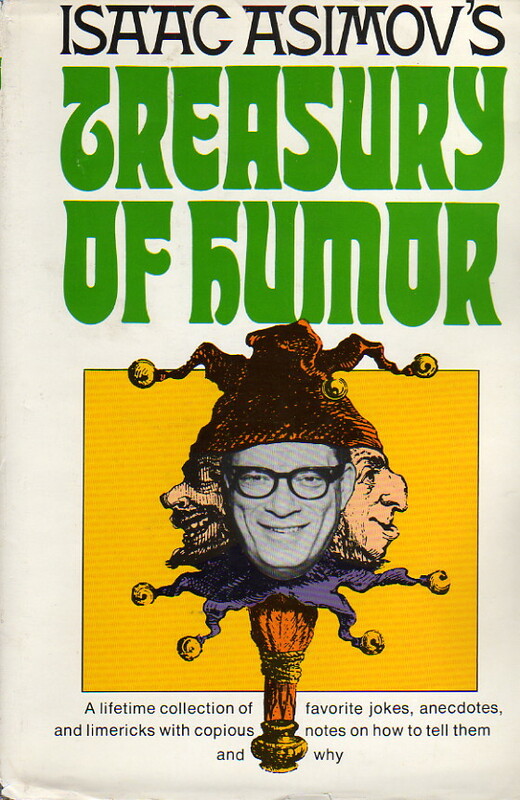 Written by Asimov to escape the misery of an enforced vacation (compounded by the fact that Asimov’s first marriage was in the process of collapsing), the book has an awful lot of funny, funny jokes on all kinds of subjects. And Asimov has thoughtfully stuck the “dirty” ones at the end where people who are offended by such things—such as my younger self—can more easily avoid them. To be sure, not all the jokes are funny, and Asimov intersperses his thoughts on humor and how to tell jokes, which some people may find distracting (I don’t). It’s still a terrific book and highly recommended. One final personal note. My father wasn’t a science fiction fan, and he didn’t read much non-fiction, either. He was, however, a jokester and never passed up an opportunity to pick up new jokes. When I first checked this particular book out of the library, he had to wait for me in the car for a couple of minutes and I when I came back, I caught him chuckling to himself over joke 147. Later, several years after his death, I happen to notice penciled neatly in my father’s handwriting inside the back cover of my copy of Isaac Asimov’s Treasury of Humor: “94 174 183 195 234.” Not, perhaps, the five funniest jokes in the book, and he clearly never worked his way all the way through it, but it warms my heart to have it there and know that this book, at least, we shared.